MANILA, Philippines - Tropical Cyclone Warning Signal (TCWS) No. 2 was raised in ten areas of Luzon as 'Bagyong Carina’ (international name: Nida) has slightly intensified and now poses threat to Isabela-Cagayan area, the state weather bureau PAGASA said on Sunday, July 31. 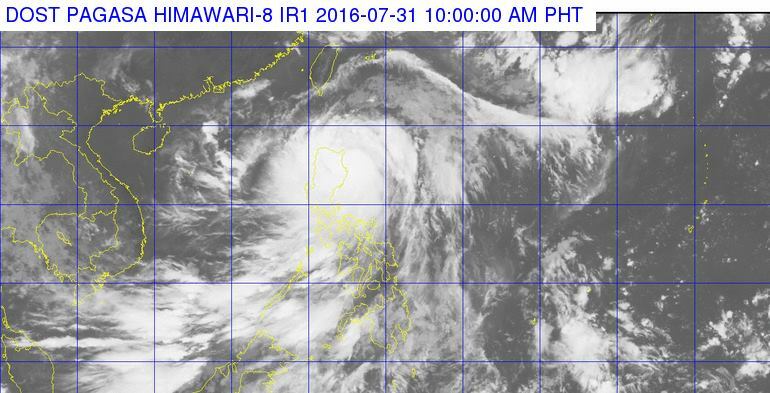 'Bagyong Carina' is expected to make landfall in Isabela-Cagayan area Sunday afternoon. At 10:00 a.m. today, the center of Severe Tropical Storm "Carina" was estimated based on all available data at 160 km East Southeast of Tuguegarao City, Cagayan (17.4°N, 123.2°E). It has with maximum winds up to 95 kph near the center and gustiness of up to 120 kph. It is forecast to move northwest at 20 kph. Maintaining its speed and movement, 'Carina' is expected to make landfall in Isabela-Cagayan area on Sunday afternoon, PAGASA weather forecaster Samuel Diran said. Once it makes a landfall, it is expected to slightly weaken, he added. Duran also said ‘Carina’ is expected to exit the Philippine Area of Responsibility (PAR) on Monday and will head towards southern China. Meanwhile, TCWS No. 2 (61-120 kph expected in 24 hours) is raised in the provinces of Isabela, Ilocos Norte, Ilocos Sur, Apayao, Mountain Province, Ifugao, Kalinga, Abra, Cagayan and Babuyan Group of Islands. TCWS Signal No. 1 (30-60 kph expected in 36 hours) is hoisted over Batanes Group of Islands, Benguet, La Union, Nueva Vizcaya, Quirino, Pangasinan, Nueva Ecija and Aurora. Areas under TCWS #1 and #2, MIMAROPA, the rest of Central and of Northern Luzon and the provinces of Quezon and Camarines Norte are alerted against moderate to heavy rains which may trigger flash floods and landslides. Fisherfolks are alerted against rough to very rough seas over the eastern seaboard of Southern Luzon. For Sunday’s forecast, PAGASA said stormy weather with rough to very rough seas will prevail over Isabela, Ilocos Norte, Apayao, Kalinga, Abra and Cagayan including Babuyan Group of Islands. Rains with gusty winds will be experienced over the provinces of Ifugao, Benguet, Ilocos Sur, La Union, Mt. Province, Nueva Vizcaya, Quirino and Aurora. Cloudy skies with moderate to heavy rains and thunderstorms which may trigger flashfloods and landslides will prevail over the rest of Cagayan Valley and Cordillera and the Provinces of Quezon and Camarines Norte while Cloudy skies with light to moderate rains and thunderstorms is expected over Metro Manila and the rest of the country. Moderate to strong winds blowing from the northeast to northwest will prevail over the rest of northern and central Luzon and from the west to southwest over the rest of Luzon. The coastal waters along these areas will be moderate to rough. Elsewhere, winds will be light to moderate coming from the southwest with slight to moderate seas.